Right now on Amazon (just click the cover above) for $4.99… Kobo readers will have to wait for a bit. This is “book 2” of the story. The first offering was of course, “131 Days” which was released way back in August of 2011. Sales for book one weren’t great, actually, but I liked the story, liked it enough to do a book 2. And I’m presently working on book 3. 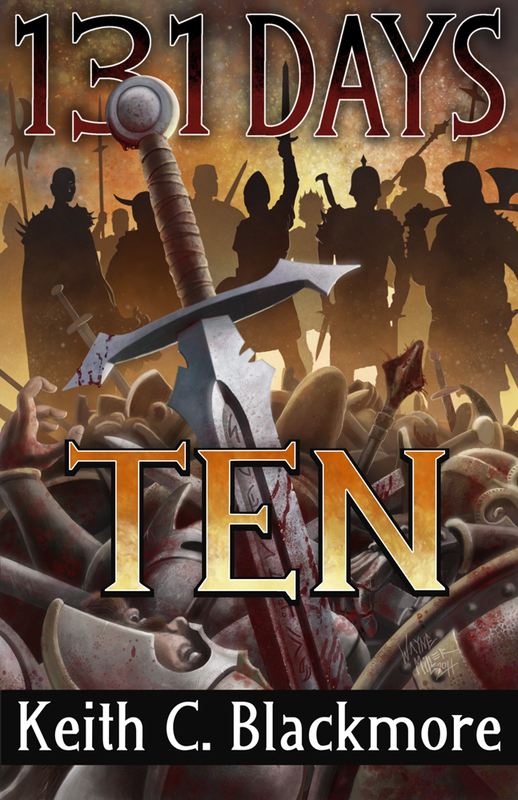 Don’t read these out of order–start with the novella “131 Days.” It’s cheaper, shorter, and if you like what you read, then continue on to TEN–which is roughly 350 pages of pit fighting mayhem and intrigue… if you’re into that sort of thing. Cover by the talented M Wayne Miller. Edited by my long time editors Red Adept Publishing. Formatted by Polgarus studio. Can’t wait for the third book. Keep up the awesome work. Thanks for response, yes I did read book 2 and it was great! I’ve just started reading “White Sands…”. Question, is there any chance Blood and Alwan might cross paths with Halm and the gang later on? Thanks again. Sorry I meant Bloor and Alwan… auto correct kicked in. Ah, no. No plans for such a meeting between those characters. I’m playing with the idea of a sequel to “The Troll Hunter” but that’s far down the line and after I’ve completed 131 and a couple of horror books. I’m not really certain of when 131 will be finished either, but if the series starts selling, you can be sure I’ll be working on finishing the story before… well, before George Martin finishes his seven book epic. He-Dog will also be a series of books, centering around his quest for vengeance, and those books will be more action based as well as stand-alone adventures. All stories take place in a fantasy world as of yet unnamed (all of the good names have been taken), but I have my maps here, and pretty much any fantasy I write will be based in that world. When I can afford it, that map will be made available to folks. Thanks for picking up “White Sands, Red Steel!” Hope you like it.